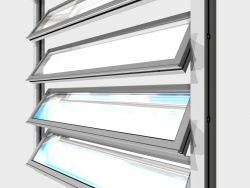 Coltlite is a natural louvred ventilator suitable for natural day to day and smoke control ventilation. Most variants conform to both EN 12101-2 as smoke ventilators and EN 14351-1 as windows and all are CE marked. 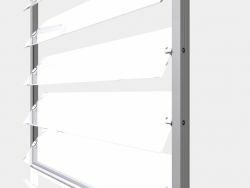 It can provide inlet and extract ventilation as well as the entry of natural daylight for most kinds of industrial and commercial buildings. It achieves high acoustic, thermal and aerodynamic performance. It is suited for installation into the façade. Its form and function makes it particularly suited to naturally ventilated buildings where good aerodynamic and measured free area ventilation is required while achieving high acoustic, thermal and aerodynamic performance. 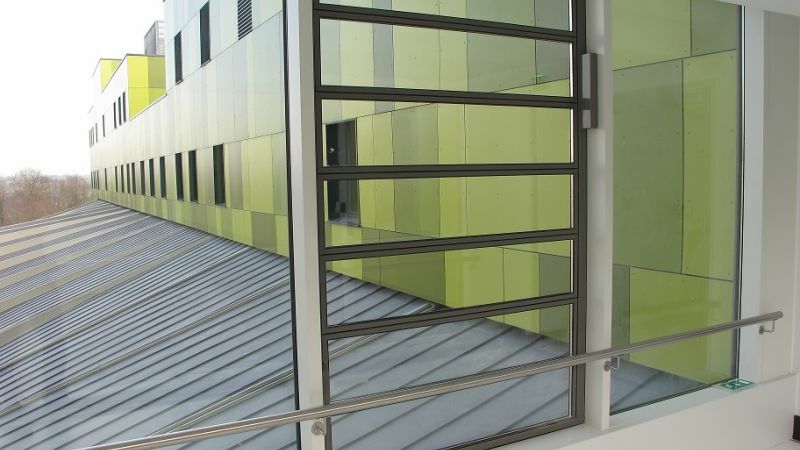 Whilst it is primarily designed as a glazed element of the building envelope, it can also be applied as a high specification fire, smoke and air control damper. Typical applications are hospitals, schools, shopping centres, apartments and commercial buildings. A wide range of applications – Most versions of Coltlite are classed as dual purpose ventilators, providing both day to day and smoke control ventilation. It can also be installed either for low level air inlet or for high level extract. Coltlite is also often used as a termination piece for large ducted or air handling systems. 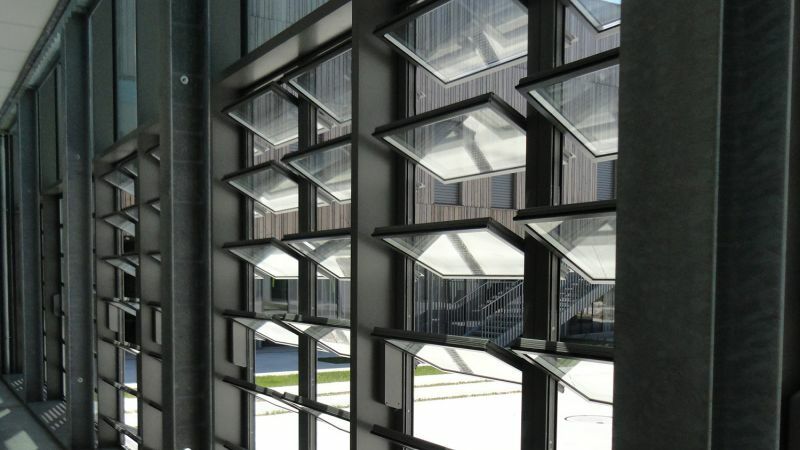 Glass versions allow the entry of natural daylight, and a wide range of infill panels are available. 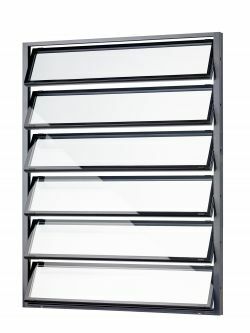 Options include pneumatic, electronic or manual controls and a wide range of louvre types, accessories and finishes. High performance - Coltlite has high aerodynamic, acoustic and thermal performance, and has a high resistance to the effects of fire. See the leaflet for further details. Certified performance – All versions of Coltlite except CLS 45 and CLST have been exhaustively tested and certified to EN 12101-2: 2003 as dual purpose ventilators in accredited third party test laboratories. In addition all ventilators have been tested to EN 14351-1 which guarantees their performance as façade elements. All ventilators are CE marked accordingly. High performance in fire - One of the fire consultant’s main design considerations is to make sure that any smoke emitted by a fire is evacuated from the building in a controlled fashion. Special arrangements need to be considered, in particular for escape routes such as in stairwells. Coltlite is very suitable for protecting escape routes since it has a high aerodynamic efficiency, opens quickly, has large openings and does not get in the way of people trying to leave the building. 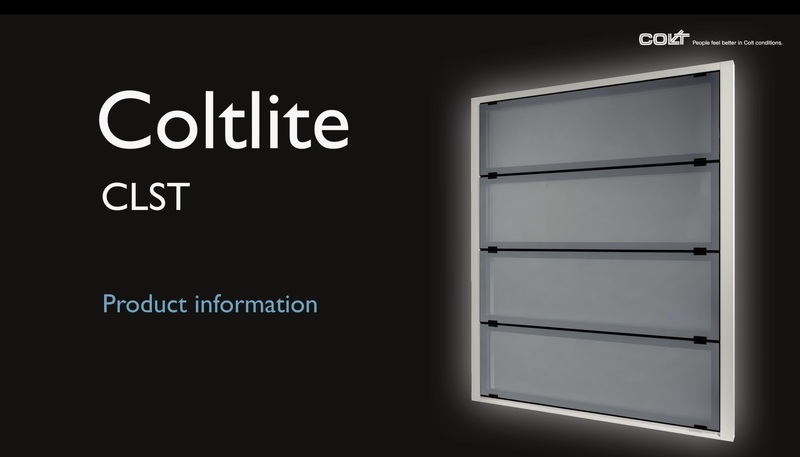 Easy to install - Coltlite is delivered fully assembled to site into a structural opening or curtain walling. It must be installed in the vertical. It has a wide range of base profiles to suit most sheeting, curb or glazing applications. 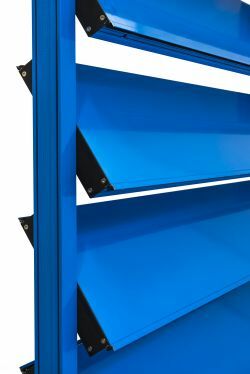 Safe in operation – With electric versions there is an optional device to reduce the speed and force of the closing louvres in order to reduce the risk of finger trapping. Durable – The frame is manufactured from tough, corrosion resistant aluminium alloy, with stainless steel fixings. Quality of manufacture - Coltlite is manufactured under the ISO 9000 quality standard. Each unit is given a functional test before despatch. Aesthetic design – Coltlite uses narrow framework and motors can be hidden within the frame or are small in size. For the highest acoustic and thermal performance. Thermally broken extruded aluminium outer frame, face frame width 40 mm. Framed louvres set into thermally broken frames. Double glazed louvres with 28mm thick clear toughened, float or laminated glass. Externally tested to and in compliance with EN 12101-2 as a smoke ventilator and CE marked. 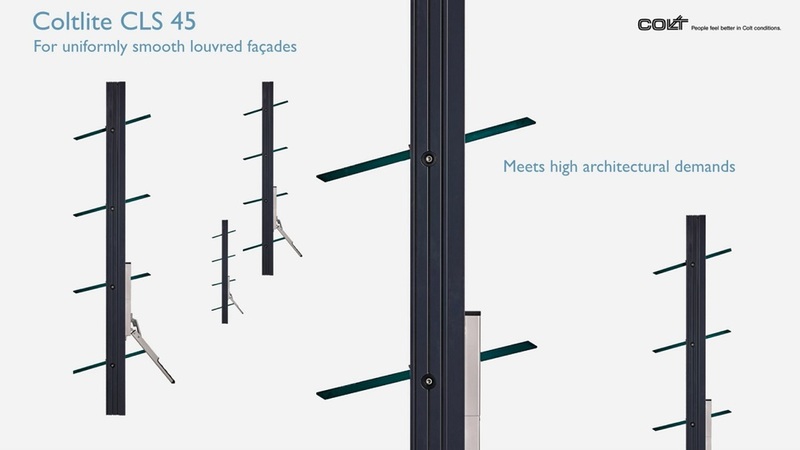 Externally tested to EN 14351-1, guaranteeing its performance as a façade element. Manufactured under the ISO 9001 quality and ISO 14001 environmental management standards. For high acoustic and thermal performance. Non-thermally broken extruded aluminium outer frame, face frame width 40 mm. Framed louvres set into non-thermally broken frames. Double glazed louvres with 28mm thick clear toughened, float or laminated glass. Externally tested to and in compliance with EN 12101-2 as a smoke ventilator and CE marked. Externally tested to EN 14351-1, guaranteeing its performance as a façade element. Manufactured under the ISO 9001 quality and ISO 14001 environmental management standards. For the highest aerodynamic performance where thermal insulation is not a key requirement. Non-thermally broken extruded aluminium 40 mm wide visible outer frames with frameless controllable, single glazed, overlapping glass louvres and concealed mechanisms. 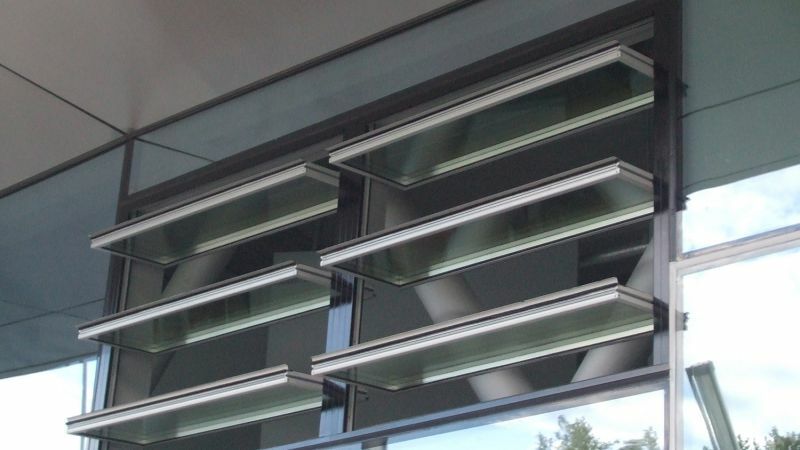 Louvres with either 8mm, 10 mm or 12 mm thick toughened, float or laminated glass. Overall frame depth 47mm, frame face width 40mm. Externally tested to and in compliance with BS EN 12101-2 as a smoke ventilator and CE marked. Externally tested to EN 14351-1, guaranteeing its performance as a façade element. Manufactured under the ISO 9001 quality and ISO 14001 environmental management standards. Smooth, flush-glass design with bevel-edged glass louvres and point-fixed louvre brackets without the need for frames, so a continuous appearance as seen from the outside. Non-thermally broken extruded aluminium outer frames. Frameless single glazed controllable louvres, closing flush, with either 8mm, 10 mm or 12 mm thick toughened glass. Overall frame depth 47mm, frame face width 40mm. For installation in the vertical only. Externally tested to EN 14351-1 and CE marked, guaranteeing its performance as a façade element. Not tested or certified for smoke control ventilation. Manufactured under the ISO 9001 quality and ISO 14001 environmental management standards. 47mm wide thermally broken extruded aluminium outer frames, frame face width 40mm. 34mm overall width framed stepped-edge double-glazed louvres set into thermally broken frames which are only visible from the inside. 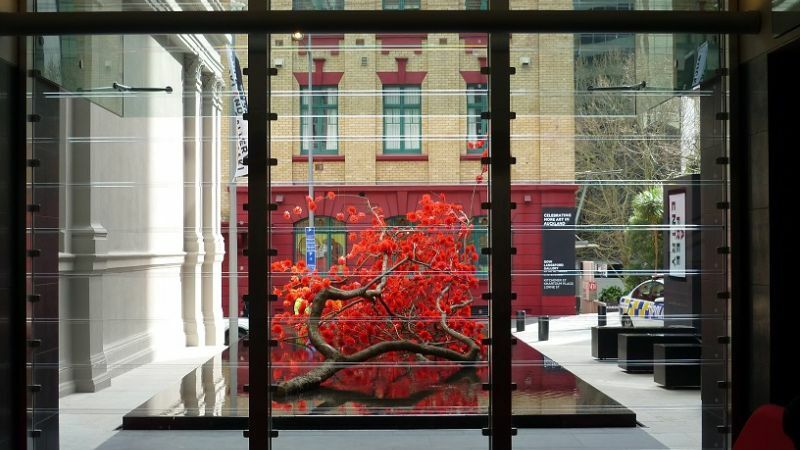 Outer louvre glazing is toughened glass, inner is float, laminated or toughened glass. Completely flat glazed appearance as seen from the outside. Externally tested to EN 14351-1 and CE marked, guaranteeing its performance as a façade element. Not tested or certified for smoke control ventilation. Manufactured under the ISO 9001 quality and ISO 14001 environmental management standards. 47mm wide thermally broken extruded aluminium outer frames, frame face width 40mm. 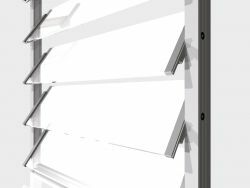 Outer louvre is thermally broken aluminium extrusion with optional additional insulation. Externally tested to EN 14351-1 and CE marked, guaranteeing its performance as a façade element. Not tested or certified for smoke control ventilation. Manufactured under the ISO 9001 quality and ISO 14001 environmental management standards. 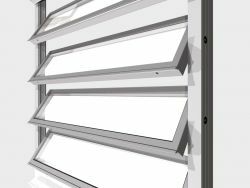 Coltlite CLT natural louvred ventilator, suitable for natural day to day ventilation and smoke control. For installation in the vertical only. Tested to and in compliance with EN 12101-2, and CE marked. Manufactured under the ISO 9001 quality and ISO 14001 environmental management standards. Thermally broken extruded aluminium outer frame, frame width 40mm, with framed louvres set into thermally broken frames. From 300mm to 2000mm in width, and from 250mm to 3000mm in height as one module. Thermally broken, 47mm deep. 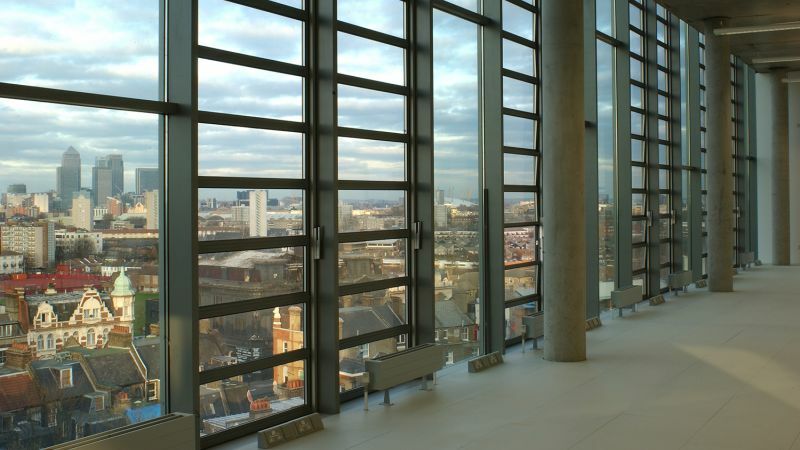 Glazing seals comprise double weather strips with a nylon lip between, and the horizontal glass edges of the louvres are enclosed with aluminium sections which have two overlapping weather seals for excellent air-tightness. 28mm clear laminated double glass. 28mm overall insulated metal skin panel infill. Louvre height from 150mm to 350mm. Blade pitch from 155 to 355mm (depending on overall size of complete unit) with central pivot point. Blade frame to be a maximum of 49mm between glass surfaces. Visible width of horizontal louvre frame 44mm when looking from the outside. on either side frame and with a typical operation time of 32 seconds. Optional device to reduce the speed and force of closing louvres, to reduce the risk of finger squeezing (some electric versions only). If used as a smoke ventilator, activation is either by local thermal fuse which opens the unit at a pre-selected temperature (pneumatic version only), or by responding to an external release signal. Coltlite CLN natural louvred ventilator, suitable for natural day to day ventilation and smoke control. For installation in the vertical only. Tested to and in compliance with EN 12101-2, and CE marked. Manufactured under the ISO 9001 quality and ISO 14001 environmental management standards. Non-thermally broken extruded aluminium, frame width 40mm, outer frame with framed double glazed glass louvres into non-thermally broken frames. Blade pitch 155 to 355mm (depending on overall size of complete unit) with central pivot point. Blade frame to be a maximum of 49mm between glass surfaces. Visible width of horizontal louvre frame 32mm when looking from the outside. If used as a smoke ventilator, activation is either by local thermal fuse which opens the unit at a pre-selected temperature, or by responding to an external release signal. Coltlite CLS natural louvred glazed ventilator, suitable for natural day to day ventilation and smoke control. For installation in the vertical only. Tested to and in compliance with EN 12101-2, and CE marked. Manufactured under the ISO 9001 quality and ISO 14001 environmental management standards. Non thermally broken extruded aluminium, outer frame 40mm thick with frameless controllable, single glazed, overlapping glass louvres. From 300mm to 1800mm in width, and from 250mm to 3000mm in height as one module. 8mm / 10mm / 12mm overall clear toughened, float or laminated glass with overlapping blades. Louvre height from 205mm to 395mm. Blade pitch 155 to 355mm (depending on overall size of complete unit) with central pivot point. Tested to and in compliance with EN 12101-2, and CE marked. Coltlite CLS 45 natural louvred ventilator, fitted with chamfered / bevelled glass, suitable for natural day to day ventilation. Non-thermally broken extruded aluminium outer frames. Frameless single glazed controllable louvres, closing flush, with either 8mm, 10 mm or 12 mm thick toughened bevelled glass. Overall frame depth 47mm, frame face width 40mm. For installation in the vertical only. Not tested or certified for smoke control ventilation. From 300mm to 1600mm in width, and from 300mm to 3000mm in height as one module. 8mm / 10mm / 12mm overall clear bevelled toughened glass. 170 - 350mm (depending on overall size of complete unit) with central pivot point. The following performance attributes follow tests to EN 14351-1:2006 (standard for windows and doors). The exact performance attribute will depend on the chosen size, controls, and louvre type. Coltlite CLST natural louvred ventilator, with completely flat glazed appearance as seen from the outside, suitable for natural day to day ventilation. 47mm wide thermally broken extruded aluminium outer frames, frame face width 40mm. 34mm overall width framed stepped-edge double-glazed louvres set into thermally broken frames which are only visible from the inside. For installation in the vertical only. Not tested or certified for smoke control ventilation. From 300mm to 1600mm in width, and from 250mm to 3000mm in height as one module. Outside is toughened bevelled glass; inside is float, laminated or toughened glass. 34mm overall width. 200 - 350mm (depending on overall size of complete unit) with central pivot point. The following performance attributes follow tests to EN 14351-1:2006 (the standard for windows and doors). The exact performance attribute will depend on the chosen size, controls, and louvre type.